When the day has finally come to start broadcasting, here is what to do. For Live broadcasting, you can use the free streaming service from Youtube: Hangouts on air. 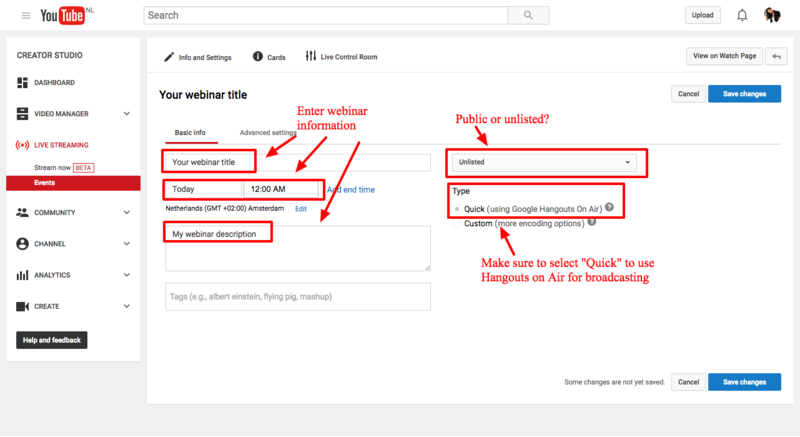 You can start a Hangouts on Air on the Youtube site, so you will need a free Google/Youtube account to use Hangouts on Air..
On the 'live page' settings within the WP WebinarSystem plugin there is an orange button which says 'Start HOA broadcast from Youtube Site'. Click on this button to be redirected to the Youtube Live website, where you can create your broadcasting event (Make sure you are logged in with your Google/Youtube account). 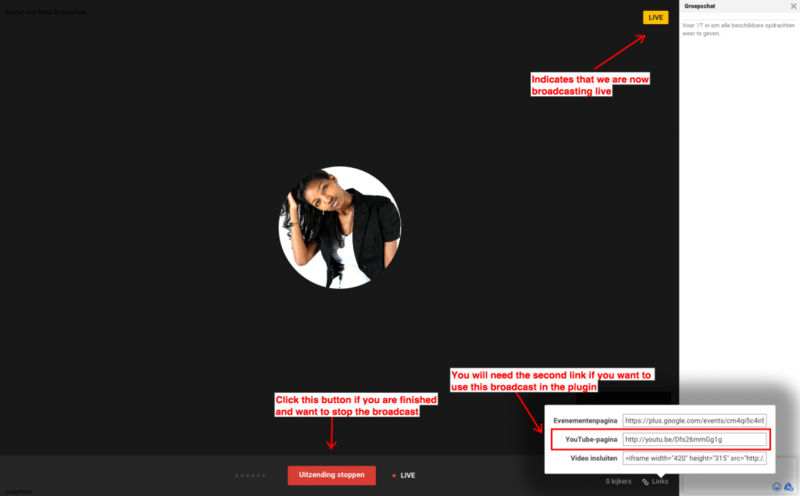 and make sure to select the 'quick (using Google Hangouts on Air)' option! If you don't want your livestream to be publicly broadcasted on Youtube, then select 'unlisted', otherwise just leave this option on 'public'. DON'T use the 'private' option, because only you as a logged in user will have access to the output of the broadcast. Your viewers won't see it in this case. Save the changes with the blue button on the bottom of the page. When you are done with the basic info, go to the 'advanced settings' tab to check some settings. Make sure the 'allow embedding' option is selected, so you can play the stream within your WP WebinarSystem webinar page. Also, there is a small latency when using Google Hangouts. The delay is between 5 and 20 seconds, depending on your internet connection. If you want the smallest amount of delay, then check the settings to optimize the stream. Make sure the 'optimize for interaction' option is selected. Great! So you configured your Hangouts on Air. To start/enter your hangout environment, click on the blue “Go Live now” button at the bottom of the page. This will take you to the actual hangout screen. Or enter in details to schedule your event for later. Here you will be broadcasting your webinar. You can share your video, voice, and your screen through Hangouts on Air. Before you start your broadcast, you will have to grab the URL to your Hangout, and place this in WP WebinarSystem. In the animation below you will see where you can find the link in the Hangouts on Air window. 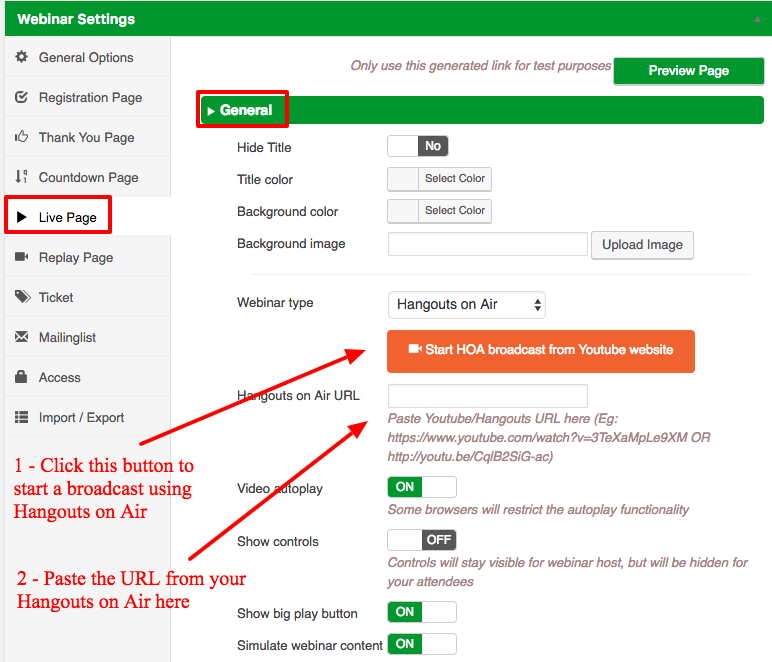 Copy the first link and place this on the 'live page' settings of your webinar. Make sure the webinar type is configured as 'Hangouts on Air', and save your settings. Don’t forget to “save” the page after pasting your link! 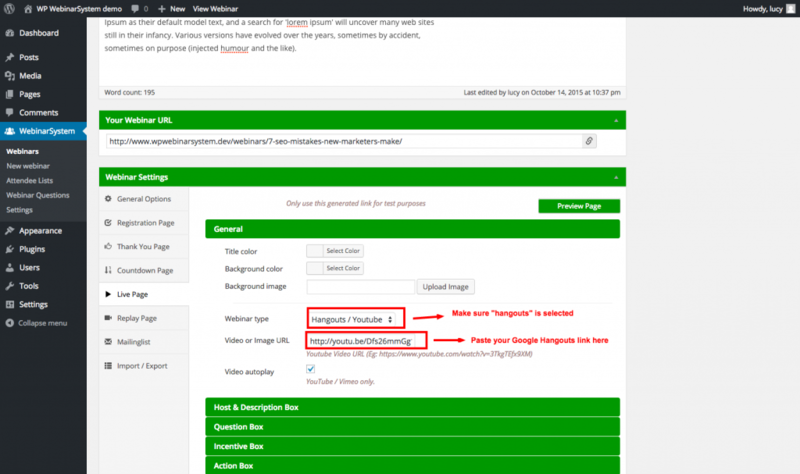 If you have placed the URL of your Hangout in WP WebinarSystem, you can go live. 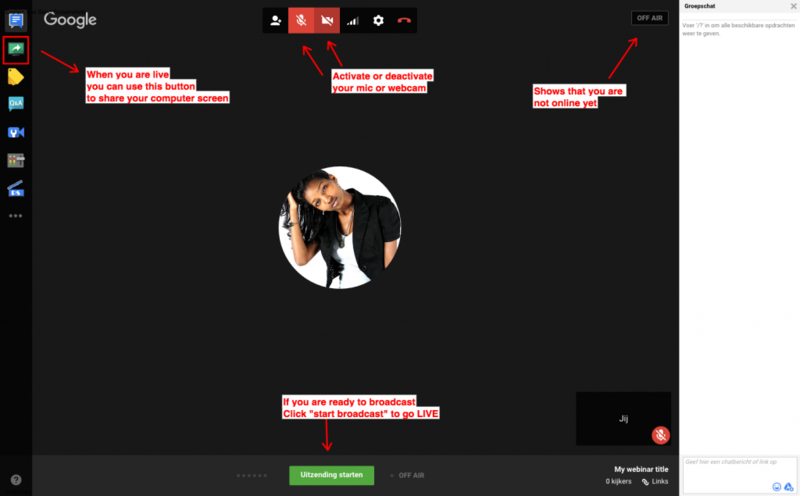 – You can start your broadcast by clicking on the green “start broadcast” button in Hangouts on Air. – You also need to set the webinar status to “Live” in WP WebinarSystem, so your attendees will be redirected to your Live page automatically and can see what you are broadcasting. Below you will find a brief description of the Google Hangout window. If you want to learn more about this tool, then please read their manual. As soon as you start the broadcast AND the webinar status in WP WebinarSystem is “live”, your viewers will see your broadcast and can interact with you. There is a small latency when using Google Hangouts. The delay is between the 5 and 20 seconds, depending on your internet connection. If you are finished with broadcasting then click on the red button which says “stop broadcast”. 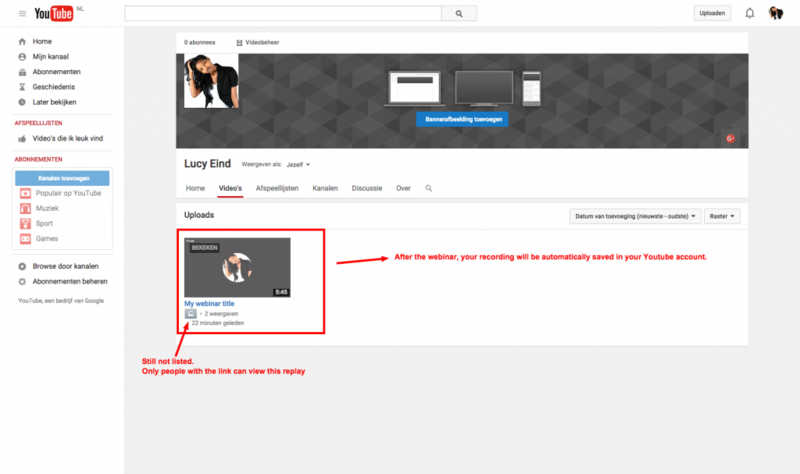 Your broadcast will end and Youtube will automatically generate a replay of your broadcast for you. After a few minutes, this replay will be available in your Youtube environment. If you have chosen not to share your hangout publicly, then the replay won’t be publicly available either. Only people with the link to your live broadcast will have access to the replay because Youtube uses the same URL for both. 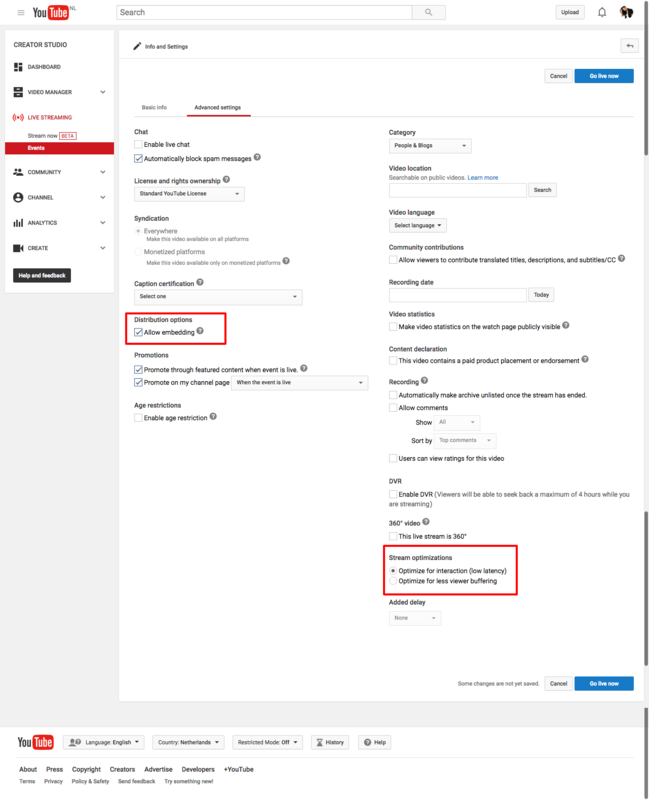 If you want to make a replay available for your audience, then copy the Hangout link from your live page to the replay page settings in WP WebinarSystem. Also, don’t forget to adjust the status of the webinar to “replay”. If you don’t want to make the replay available, then simply adjust the webinar status to “closed”.